ECE graduate student Captain Janice Blane was recently awarded the Lieutenant General Thomas M. Rienzi Graduate Award. Before joining ECE ILLINOIS in 2012, Blane served as an officer in three overseas Army deployments. 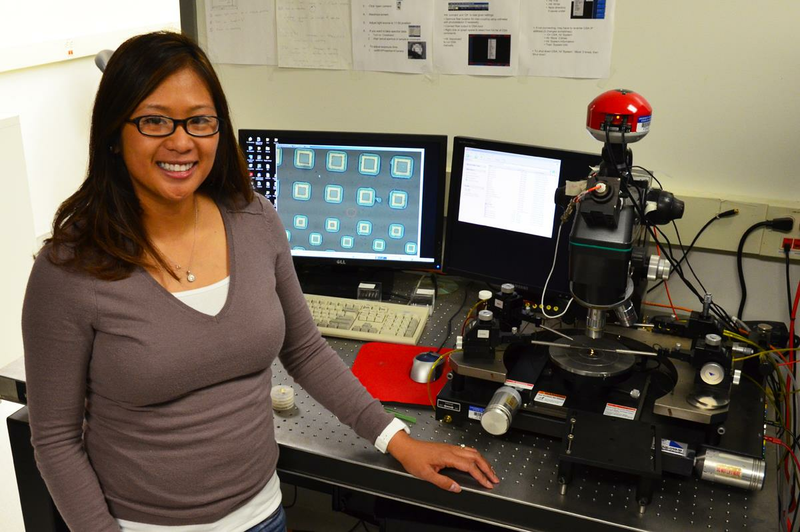 Her graduate research with Professor Kent Choquette focuses on the high-speed modulation of vertical-cavity surface-emitting lasers (VCSELs). When ECE graduate student Janice Blane was still a prospective student, considering advisers and research programs, she did what anyone would do: she contacted faculty members who were doing innovative research, asking about opportunities in their labs. That seems normal, only, in 2012, when Blane emailed ECE Professor Kent D Choquette, who is now her adviser, Blane wasn’t sitting in a café near her undergraduate electrical-engineering building, typing on her laptop. Her emails were coming from eastern Afghanistan. At that point, Blane, who recently received the Lieutenant General Thomas M. Rienzi Graduate Award — an ECE ILLINOIS award that recognizes one student veteran each year — was serving as a company commander in the U.S. Army. She was responsible for air traffic services and airfield management at a military base. On previous tours, she served first as a helicopter company platoon leader, training and overseeing 27 pilots and crew chiefs, and conducting missions. On her second tour, she was responsible for assigning helicopter missions in eastern Afghanistan, near Kabul. While her responsibilities were supervisory during these deployments, Blane nevertheless found opportunities to use the electrical engineering background she received as an undergraduate at West Point. As company commander on her third tour, there was a communications and electronics section under her purview, and that team used the standard array of electrical equipment. “Ma’am, what do you know about oscilloscopes?” she remembers one of the technical crew members asking her. “Electrical engineer,” she responded, pointing to herself, although she will concede that having someone in her role with an electrical engineering background was somewhat unusual. Many of her engineering peers from West Point went into the Signal Corps of the Army, whereas she went into Aviation Branch. Most likely, the officers in the Signals Corps never learned to fly helicopters. Following her stateside return in 2012, Blane transitioned almost immediately into academic research for her master’s degree at Illinois. Like her military colleagues, Blane found her fellow researchers — from faculty members to lab mates — to be supportive and tight-knit. Blane is writing her thesis on the characterization of VCSELs (short for vertical-cavity surface-emitting lasers), which are essential to the infrastructure for fiber optic communications. Specifically, Blane’s project focuses on high-speed modulation: the rate at which lasers transmit digital data. The more rapidly this happens, the faster images could be shared with a video-chatting service, for example. There would be less lag time, the images clearer. High-speed modulation of VCSELs is one of those background technologies that could make day-to-day routines even more convenient, seamlessly fusing the digital realm for friends and colleagues around the world. Since Blane has been here on campus, researchers from West Point have visited, including Colonel James Raftery (PhD ’05), another alumnus of Choquette’s lab, who is the director of the West Point’s Photonics Research Center and an associate professor. Blane guided cadets through lab and demonstrated the procedures for VCSEL characterization. “They’re actually replicating my research over there at West Point,” she said. When she graduates this spring, she’ll return to West Point as an instructor of electrical engineering and continue with her VCSEL project. Like Blane, the late Lieutenant General Thomas M. Rienzi (MSEE ’48), who established this award in 2011, received his undergraduate in electrical engineering from West Point. Following overseas deployment in Burma during World War II, Rienzi came to Illinois for graduate studies. He was ultimately promoted to deputy director general and chief engineer of the NATO Integrated Communications Systems Management Agency based in Brussels, Belgium and retired in 1979. At this point, the path between Illinois and West Point has become a well-established passage, as demonstrated by Blane, Raftery, Rienzi, and others.